The war finally reached Atlanta in July 1864 – the Battle of Peachtree Creek was fought on July 20, the Battle of Atlanta was waged on July 22, and the Battle of Ezra Church was decided on July 28, but it would be five long weeks until the city of Atlanta would surrender to Union forces on September 2, 1864. During the five week long siege General Sherman’s forces settled in to shell the city and sent raids west and south of the city to cut Confederate supply lines from Macon, Georgia. 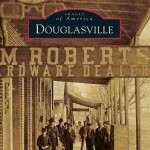 We know a good deal about this time period and what was occurring due to diary entries and letters written by Atlanta citizens who remained in the city during those terrible weeks. A letter written by Marcus A. 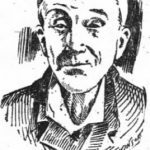 Bell, an Atlanta attorney and real estate dealer on August 11, 1864 is just one of many accounts. 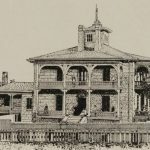 Bell, a Confederate officer and aid to General Howell Cobb, had reached his home, Atlanta’s famed Calico House, at the corner of Wheat and Collins Streets now known as Auburn Avenue and Courtland Street, on August 10 for a twenty-day furlough. 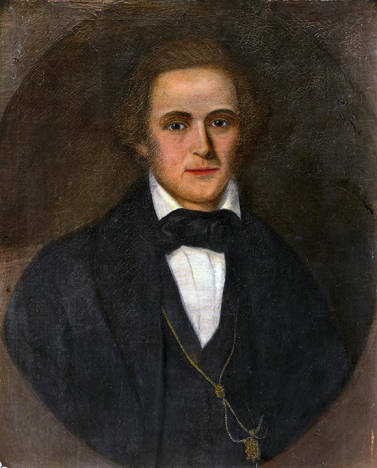 Bell’s wife and children had left the city on July 10 or 11 for Elbert County to remain with family during the siege and eventual occupation of Atlanta. Union forces began shelling the city on July 20, 1864. On August 9 via a dispatch sent to Major General Halleck, Sherman advised he had “threw into Atlanta about 3,000 solid shot and shell today.” What was described as “siege cannons” were brought by rail and began firing over the city on August 10, the day Bell arrived for his furlough. By the time the shelling stopped on August 25 those four cannons alone fired 4,500 rounds on the city. I provide Bell’s letter below as it appeared in The Atlanta Constitution on October 18, 1919 presented by Bell’s son, Piromus. Marcus Bell wrote the letter over a two to three-day span. Throughout the letter Bell writes the word “Bang!” each time he heard a shell explode. 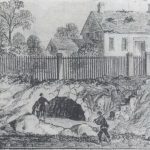 I also find it interesting he writes of citizens building “bomb proofs” which were often crudely dug caves or holes where citizens hid thinking they were safer than remaining in their homes during the shelling. Having been granted a twenty days’ furlough, I arrived at home about…yesterday afternoon, when huge and fiery missiles of death were flying in thick and fast upon this city. I was not frightened, as the coward, but to be subject at any moment to be torn into pieces by unseen monsters, will make the stoutest heart tremble. I am writing on my convenient old walnut desk now, about 5 o’clock p.m., and since I commenced four shells have burst between this point and toward the carshed (Union passenger depot). Though the bang! shelling is not so furious as when I first arrived, nor during nearly all of last night, it still continues. The situation as to the fighting forces around Atlanta is now about as follows: Here a map was inserted [that was not included in the newspaper]. Bang! Went another shell, Bang!, Bang! Again. I must write and let them rip. We are strongly entrenched. I went over to our cemetery lot yesterday and while I was there I could hear the firing in the heavy skirmish fight broken loose on our extreme east – the thunder of artillery and musketry was like the roaring of many waters, and in the falling of gentle showers around me I turned and beheld the graves of brother Henry Bibb Bell, killed in Tennessee with ‘Duty unto Death’ on his tomb, and of father, on whose tomb ‘He was known to be a peacemaker,’ met my eye – and, as I stood beneath a mourning pine, the roaring of musketry and cannon filled the air with sights. I gave my heart up to sadness at the cruelties of man. This was yesterday; and last night about 12 o’clock commenced a most furious bombardment of the city. I was awakened from slumbers and stood at the west window of formerly Mrs. Buchanan’s room. There were three batteries shelling – seemed to be about four miles out on Peachtree, or west of Peachtree road. At the flash of the guns the heavens would lighten; then in a few seconds a ball of fire, climbing up the heavens and flying along like a meteor, but steadily – there it goes – it flies – it passes my front view; and, seemingly about 100 yards in the rear of its hot track, you hear shrieking, hoarse, groaning noises, indescribably harsh – and Bang! goes the bomb about the vicinity of the city hall. Yonder goes another! Bang! just over the house tops near the Beasley boarding house. Yonder will come another – Bang! about the Dawson building. Look now for the flash! Yonder comes the fire-ball – it thunders – the ball flies – did not burst, but you hear it crash through some building. I look out the window for the flash. It was further south – an enfilading fire. I see the fire ball – I retire behind the rock wall of the house – Bang! about the car shed (Union passenger depot). Here comes another – Bang! with a horrible closeup, in mid-air. Thus, for three mortal hours I viewed the terrible monsters of death. I go down in our room and try to sleep. This morning I go about town. Now you can see no ‘fire balls,’ but Bang! here and there. I take as much risk as I think prudent and go back to my house. A very great many houses are struck, and some eight to ten persons killed, and hundreds are the tales of hair-breadth escapes. 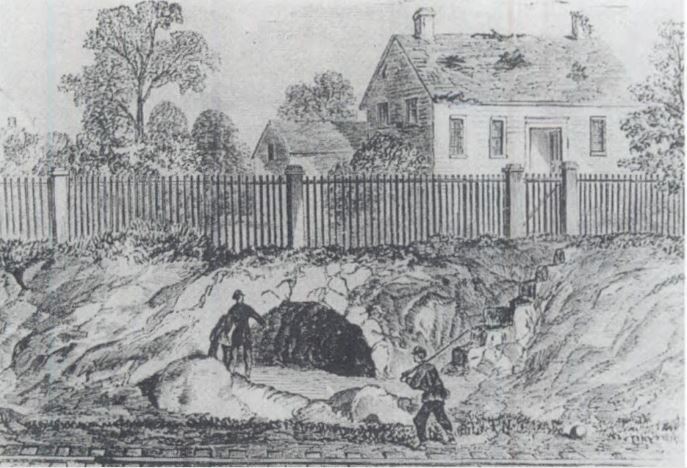 The shells have fallen in our front and rear yards – struck McMillan’s well and yard; one went through Charlie Schuartz’s house and one through John Butler’s well and into the kitchen and torn our wash pot into flinders. I sent you newspaper showing some casualties. 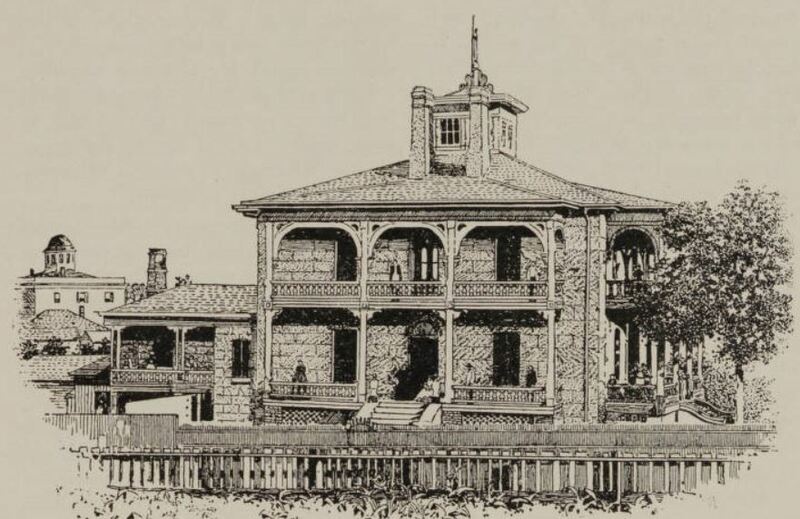 Our house was struck by a 20-pounder about two feet from the east end of the upper north veranda, on the walk, about six inches from the floor, tearing away the plastering and bruising the rock a little, and rebounded and now lies on the veranda floor. Bang! went another – just then – between our house and Mr. Alexander’s. Mrs. D.B. Dodd’s opposite to us, has been ploughed six times with huge bombs. One burst right plumb in their side gate, one near the other gate. Poor Della Pitman. I am sorry to for her. She superintended yesterday the digging of a big cave right this side of Pitman’s kitchen. It is finished – it is now full of women and children. I went over and talked to her and Mrs. Ladd. The cave belongs to her and the Pitmans. Nearly every family has one. You go over the city and everywhere during the shelling you see poor and rich men, women and children now and then poke their heads out of the little doors of these dens. Bang! went one – seemed to be about Butler’s. Fragments of shells lie on the slate roof of our house. This morning, Friday, August 12, finds me slightly unwell, owing to so much excitement and loss of sleep. The shelling last night was not so furious, but pretty severe just before day. Now, seven o’clock, slow shelling, but constant. There was a heavy skirmish fight last night at about 11 on our left. The enemy seems to be massing his forces towards East Point, south of the city, though his line reaches around on the north and east to the Georgia railroad. The fight will likely come off before I leave Atlanta and I have confidence we shall be victorious against all the odds. Your brother, Gus Hulsey and Cousin John Brantley are in the very front. The old Methodist church was pierced by shells four or five times, the bookcases and benches shattered awfully. The parsonage riddled severely. Judge William Ezzard’s and the Smith houses are injured badly. All the poorer people here ‘drew’ rations. There is no business of consequence. The burning swept all of the Connally block up to that other burning. Church going here has almost ceased – so with business. The people wander about in distress. Mr. William Downs’ house is vacant, the back door battered down by a shell, one dreadful shot went through the first stable we built, passed on and ploughed through the fence and back yard of McWilliams. It is strange so few are killed, and yet a shell strikes, now and then, some poor unoffending man or child. A man, Peter Long, was struck in both legs and died in about ten hours. Mrs. Weaver, on Walton Street, was in her kitchen with her child nearby and the shell ripped through the walls and tore her child to pieces. The young lady who was killed was in that house in front of old man Morris – the house on the Beasley lot I used to own. Cabaniss is not located yet, awaiting orders from commandant and nothing to do, hence I got the furlough. I went over to the Atlanta hospital and talked to Yankee prisoners being treated there. One said he was “fighting for the Mississippi river.” Poor deluded creatures – we should have no objection to the free navigation of that river. I am in our conservatory (the cupola atop the home). Half past 12 and much fighting near the “Distillery” – shelling rapidly. Gus is here for a short rest. We can see the smoke of the guns – the lines are so long that we are only one deep on the right, but we have trees felled in front for two or three hundred yards. Gus has learned that some Yankees visited your father’s (Elija Hulsey’s) home in DeKalb and cursed your mother terribly. All of Mr. Hulsey’s horses are stolen. You can see the enemy from the observatory of the Female college, and the lights at night. But it is dangerous to go there in daytime. Their sharpshooters have been stopping the curiosity of those who went there. I often go up to my observatory to see the signal lights at night. Very heavy cannonading going on now to our extreme left. I am now on our front veranda. Oh! One terrible explosion of a shell took place, then, like a clap of thunder. Several ladies have run in from the street and on through to our back veranda. I will try and go to see your father and mother before I receive new orders. Dr. Avary has moved back. Oh! What a fate is Atlanta’s! I hope the day of relief is near at hand! Today, we all know the outcome. Find out more about the Calico House in my post here.